This page has been viewed 5213 times. The Okeechobee Waterway, (Or the ditch as we affectionately call it) is an Army Corps of Engineers dig that utilizes the Caloosahatchee River, Lake Okeechobee, and the St. Lucie Canal. This Navigable Water way allows vessels to Cross Florida by water east or west from Atlantic Ocean in Stuart Florida or the Gulf of Mexico In Cape Coral Florida. 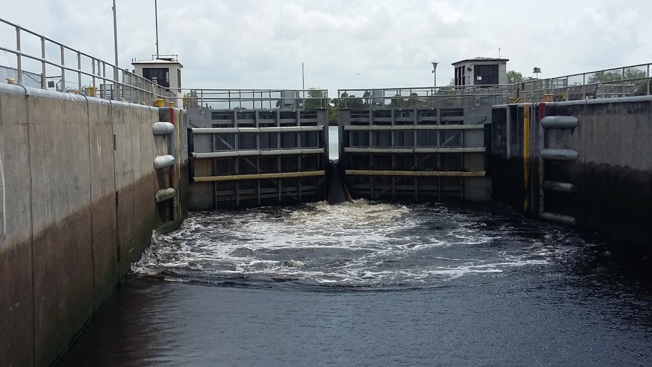 The Okeechobee Waterway Consist of 5 navigation locks and dams along the Okeechobee Waterway. There is an additional lock that is normally open in lake Okeechobee at the entrance of Clewiston FL should you choose to go this way. It is a sharp turn into a narrow lock or flood gate (Clewiston is a GREAT fuel stop complete with marina and tiki bar restaurant) at the fork in route 1 and route 2. The Okeechobee waterway (OWW) is open to vessel traffic all year round. From East to West along the Okeechobee waterway the locks are: St Lucie Lock and Dam near Stuart FL, Port Mayaca Lock and Dam near Canal Point FL, Moore Haven Lock and Dam at Moore Haven FL, Ortona Lock and Dam east of LaBelle FL, the Franklin Lock and Dam east of Fort Myers FL. 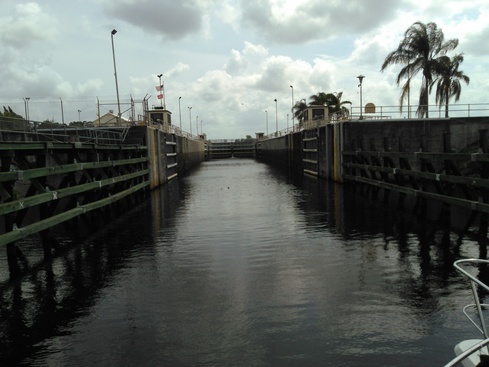 Notice is given that the U.S. Army Corps of Engineers Jacksonville District will change hours of operation at all five locks along the Okeechobee Waterway beginning 1 April 2015. 1) Above 12.5' Lock operations on demand 07:00 AM to 5:00 PM daily. 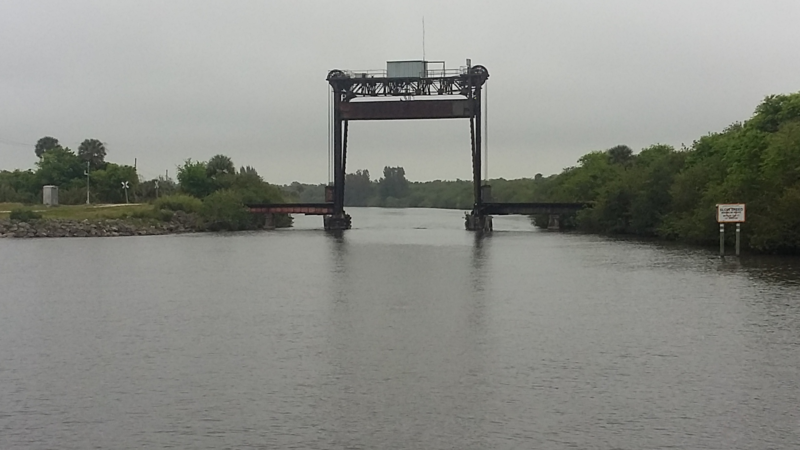 The bridge clearances along the Okeechobee Waterway: Fixed bridges offer vertical clearances of 54' or greater. Operating bridges have closed vertical clearances of between 5' and 27' many are normally open. There are many overhead cable crossings on the Okeechobee Waterway. The lowest is 3.1 NM east of the Port Mayaca RR Lift Bridge with an authorized clearance of 56'. Port Mayaca RR Lift Bridge has a limiting vertical clearance of 49'. If your vessel has a mast height greater than 48 feet, Captain James Lowe is also familiar with the southern route between the Florida Everglades and the Florida Keys (simply beautiful) or on the outside through the Florida Straights. Captain James Lowe is familiar with the route and can help you guide through the locks and around rocky reef and wrecks or deliver the boat via the waterway for you. In order to cross the Florida Okeechobee Waterway you will need to know how to contact the locks and swing bridges as well as be aware of the time of each lock or bridge opening. The St. Lucie (Stuart) Inlet has a reputation for being one of the most treacherous in Florida. Sinking and severe damage to vessels, injuries, and deaths have occurred. And to the south Jupiter inlet is just as bad. So if you have never been this through here extreme caution should be taken! And don't try it on and outgoing tide. Extreme currents and SHOALING - changing water depths can occur. Mariners should monitor VHF 22A for updates because shoals and sand bars have altered the many of Florida's inlets.